According to the U.S. Department of Justice (the “DOJ”), the term cybercrime refers to any illegal activity for which a computer is used as its primary means of commission, transmission, or storage. The list of criminal activities made possible by the widespread use of computers how grown exponentially in recent decades, and includes such acts as dissemination of computer viruses, network intrusion, identity theft, and even electronic bullying, stalking, and terrorism. 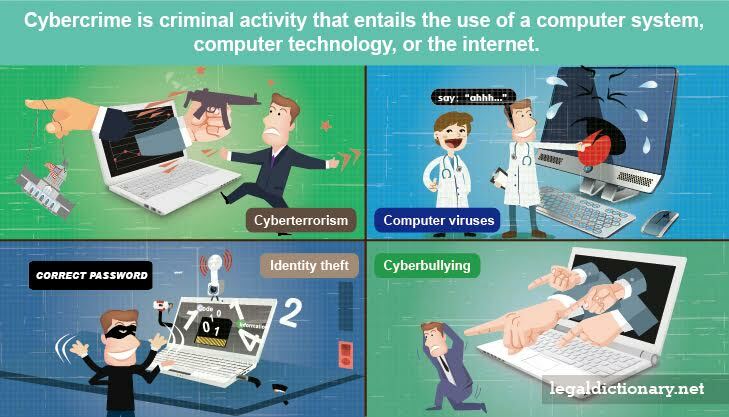 To explore this concept, consider the following cybercrime definition. noun. Criminal activity that entails the use of a computer system, computer technology, or the internet. While the term cybercrime has gained widespread recognition and popular use, it has taken some time for the term to be recognized by an actual definition used by dictionary, legal, and crime prevention sources. Cybercrime is now defined as any criminal offense that is facilitated by, or involves the use of, electronic communications or information systems, including any electronic device, computer, or the internet. While the umbrella term of cybercrime covers a great many possibilities as to types of crimes, these are broken into several categories. In some types of cybercrime, a computer or other electronic communication device is used to commit the crime, and in other types of cybercrime, the computer or device is the actual target of the crime. A computer virus is simply a small computer program that places copies of itself onto other computers without the users’ consent. The most common way for the makers of computer viruses to propagate their virus programs is to attach or embed them in emails. When the email is opened, the virus activates and does whatever it was programmed to do, such as steal valuable hard drive disk space, destroy data on the recipient’s computer, access personal information, or to send information (or itself) out to other computers using the original victim’s contact list. Identity theft involves stealing an individual’s personal information, then using that information to either use their financial resources without their consent, or to open new financial or credit accounts, enabling the identity thief to use the victim’s credit without their knowledge. Information commonly stolen to make these crimes possible include the individual’s name, date of birth, social security number, and/or credit card numbers. While such information can be physically obtained from written records, such as credit applications discarded by a retailer, it is frequently stolen through breaches in people’s computer security, spyware, and viruses. Personal identifying information can also be stolen when a computer-savvy person hacks into a computer network, such as a network over which a bank or retail establishment shares information with its branches. These types of breaches allow hackers to snare huge blocks of information at a time. Naomi breaches people’s home computers through the use of emailed viruses, obtaining what personal information she can find, such as passwords into retail accounts. One day she obtains Patty’s password to his Amazon account, and is able to log in and view the personal identifying information in his account settings, as well as the credit card he has used to make purchases. Armed with this information, including Patty’s date of birth and social security number, Naomi is able to obtain brand new credit cards, and possibly even a driver’s license with her own photo. Cyberbullying occurs when someone uses the internet, a cell phone, email, instant messaging, chat rooms, or social networks, such as Facebook and Twitter, to harass, demean, embarrass, or intimidate someone else. It is commonly a crime committed by kids and teens, as their growing access to electronic communication makes it possible to make fun of or ostracize others. The problem spreads like wildfire as the bully can hide behind the anonymity of a login identity, while encouraging other kids to join in the “fun” of harassing the victim. It should be noted, however, that cyberbullying is not the exclusive domain of adolescents, but is committed by, and on adults. Cyberbullying is a crime, garnering such criminal charges as harassment, libel, assault, and even terrorism. In addition to criminal charges, cyberbullies may be held responsible for the damage they do in a civil lawsuit, where they may be ordered to pay medical bills and other expenses, as well as money for pain and suffering and mental anguish. Cyberterrorism is defined as any threat of harm or extortion via the internet. As computers and computer systems grow in size and power, cyberterrorism makes use of well-planned attacks on government and corporate computer systems. Such attacks may include targeting computer-controlled strategic services, such as electricity, water, and communications services. Roman initiates a cyberattack on a large global corporation, stealing the personal information of its millions of customers. He then makes a small number of those records public, before contacting the corporate president to demand a large sum of money in exchange for stopping the leak. As an incentive to pay his ransom demand of $100,000,000 quickly, Roman threatens to release another 5,000 records each day until the ransom is paid. The U.S. Justice Department has now dubbed cybercrime as “one of the greatest threats facing our country.” While the focus at the governmental level is on national security, public safety, and the economic prosperity of the U.S., individuals are concerned about cybercrime prevention as it applies to protecting their own personal information. Cybercrime has become a bigger criminal moneymaker than illegal drug trafficking. Every 3 seconds, someone’s identity is stolen as a result of cybercrime. Without a quality internet security program, a computer can become infected with a virus within four minutes of connecting to the internet. Companies in the U.S. lose more than $525 million each year due to cybercrime. The FBI Cybercrime Division leads the country’s law enforcement effort to investigate, prevent, and prosecute high-tech crimes, including all manner of cybercrime. In an effort to stay abreast of emerging cybercrime trends, the FBI cybercrime division shares intelligence and evidenced gathered with both public law enforcement units and private sector cybercrime prevention partners all over the globe. Buying online – always use a legitimate, trusted payment service, and always use a credit cared because charges can be disputed if there is a problem. Seller’s Rating and Feedback – be sure to check sellers’ ratings, and make sure feedback dates are current. Be cautious of sellers with a 100% feedback score, and of feedback postings of the same date. Requests for Personal Information – never respond to unsolicited phone calls, texts, or emails requesting personal information, and never click on embedded links or open attachments. If you want to go to a merchant’s website, manually type their URL (web page address) directly into your browser’s address bar. The truth is, cyberbullying takes place every day in the United States, and most of it goes unreported. Because many people consider bullying perpetrated over an electronic device, or over social medial, are less serious than face-to-face torments engaged in by youth since time-immemorial, recognition of, and punishment for, such criminal activities are still trying to catch up to the reality of the damage done. On September 9, 2013, Rebecca Sedwick, a beautiful 12-year old girl, took her own life by jumping off a concrete silo after being repeatedly bullied and harassed by other teenage girls on social media and by other electronic means. As other teens joined in the bullying, Rebecca faced abuse by as many as 15 girls on a daily basis since the harassment began in 2012. According to the police, the 14-year old perpetrator bullied all of Rebecca’s friends as well, and encouraged the 12-year old perpetrator, who had been Rebecca’s friend, to turn on her, and to beat her up. While, in an attempt to get away from the bullying, Rebecca moved to a new school for the 2013-2014 school year, she was unable to outrun the cyberbullying. The teenage perpetrators faced felony charges of aggravated stalking. If there is a DVPO and the individual it is against, friends his children on social media accounts that were setup by there mother, but he has blocked all the wife’s family and the wife from seeing that he has friended his children and the ability to see him online. Is this considered a DVPO violation because it is an attempt to spy on their mother and her family in order to keep track of what she is doing? Internet fraud should be the biggest criminal activity in these years.